Why Do Spines Degenerate? 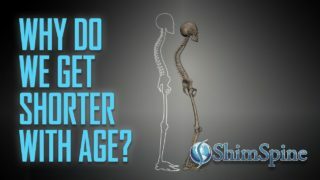 Hi, I am Dr. John Shim, and this is a common question asked by many of my patients. I hope you had a chance to already view my basic spine anatomy video, as that foundation will make it much easier to understand this Spine Degeneration discussion. To simplify how the spine degenerates, we must make some basic assumptions. The degeneration is a result of aging, not a traumatic event, or known medical condition. As you know, the spine is composed of the functional spine unit. The so called vertebral body sandwich with the intervertebral disc being the center of the sandwich. For this discussion, we will focus on the intervertebral disc. The disc is composed of two main components. The center is the nucleus pulposus. The outer section is the annulus fibrosus. Current-day research indicates the water-filled nucleus changes as we age. There are specific proteins called proteoglycans that have a water capturing property. When we are young, the proteoglycan strongly pulls in water, keeping a nucleus full of water, and maintaining its height and strength. If you MRI most healthy teenagers, the MRIs will show the discs are full of water, and as a result of this water pressure the disc walls, or the annulus are straight. The disc height is full, and tall. There is plenty of space in the foramen, and the nerve has lots of room to safely exit the spine, without any concerns for pinching. As we age, the body starts to produce a different form of proteoglycan. To simplify the discussion, each time the small cells in our body divide to produce another, it loses a bit of a marker called the teleomere. As we lose more and more of the teleomere, our resultant cells start to change. The resultant cells, in the spine, and in the cartilage will produce different proteogylcans. The proteoglycan for aging spines will not have the same water retention properties as younger cells. As a result, the disc is less full of water. The disc height reduces. The water pressure on the annulus lessens, and the annular walls start to sag, or bulge. Yes, this is the disc bulge process. As the disc height reduces, the forces on the facet joints of the spine also change. There is more excursion of the facet joint, and the facet joints may start to slide further against each other. This leads to wear of the cartilage of the facet joints. Because of the wear on the facet joints can be a painful process, the body reacts to decrease the joint forces experience on the individual facet joints surfaces by an enlarging the facet joint surface area. The facet joint enlarge or hypertrophies. This process is how bone spurs form that pinch the nerves as they exit out the foramen. Not only is the height of the formen hole decreased by the shorter disc height, but the facet joints, that are located in the back of the foramen enlarges, and also contributes to the narrowing of the space for the nerves before exiting out the spinal canal. As the discs lose its water content, the disc bulge also contributes to the narrowing of the central canal space of the thecal sac or nerve tube, causing another area of pinching of the nerves. The narrowing of the space of the nerve is the spinal stenosis process. In addition to the narrowing of the space caused by bulging of the disc, and hypertrophy the facet joints, the narrowing of the foramen by the shrinking of the disc space, there is also an enlargement of the ligaments between the vertebral bodies. The ligament that most enlarges is the ligamentum flavum. To understand how this happens, imagine stretching a rubber band. When it's stretched, it thins. When the rubber band is no longer stretched, it thickens. The ligamentum flavum is a ligament that is stretched by a tall, well hydrated disc. When the disc shrinks because it is loosing water content (proteoglycan no longer holds water), it no longer stretches the ligamentum flavum. As a result, it thickens. That thickening can contribute to the narrowing or spinal stenosis condition. While I am oversimplifying the process, I hope you can now understand how the aging process of the spine begins with disc dehydration by change of the proteoglycans. It causes disc height shrinkage, leading to facet hypertrophy, disc bulging and ligament thickening. That all leads to spinal stenosis, and facet arthritis and hypertrophy. This process is called a degenerative cascade. Thank you for staying with this video, as this degenerative cascade process will help explain many of the pains experienced by many of my patients. Thank You! Degenerative disc disease is not really a disease but a term used to describe the normal changes in the spine due to age. It happens throughout the whole spine but mostly in the lumbar discs as they have the most pressure on them throughout life. This is caused by the loss of fluid in the disc over time, which makes it less useful as a shock absorber and narrows the distance between the vertebrae. This also lessens the space nerves have to exit the spinal column. Time, and wear and tear on the disc can also cause cracks or breaks in the annulus (the outer covering of the disc). Often the disc material inside leaks out causing a disc herniation and increases acceleration in degeneration. As the space between the vertebrae get smaller, the discs get worn, and the stabilizing ligaments become less elastic, the spine becomes less stable. The facets move against each other and can cause pain or the body reacts to this by constructing bony growths called bone spurs (osteophytes). Bone spurs can put pressure on the nerve root and cause pain numbness and tingling in the extremities. People who smoke and those who do heavy physical labor, such as repeated heavy lifting, are more likely to have accelerated disc degeneration. People who are obese are also more likely to be symptomatic. Approximately 20% of younger people due to genetics, injuries to the spine or who have done years of weightlifting or extremes sports can be diagnosed with degenerative disc disease. Exercise, weight loss, and quitting smoking are ways to slow down disc degeneration. Surgical intervention would only be considered after extensive conservative care. We would like to encourage our followers to give us ideas for future blogs, videos or to just ask questions. We will get back to you, and hopefully continue to give you relevant and up to date information. 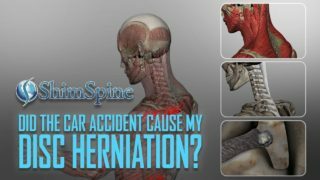 Did the Accident Cause the Disk Herniation? Ankylosing Spondylitis (AS) He’s a Believer. Are We Giving Bad Advice?